On the map to the right, the location of Arizona is colorized in red. The State of Arizona is bounded by Utah on the north, by Mexico on the south, by New Mexico on the east, and by California on the west. It is bounded by Nevada on the northwest. Arizona is the 6th largest State in the United States, covering a land area of 113,635 square miles (294,313 square kilometers). The State is made up of 15 counties. Some of them, like Navajo and Apache, are named after Indian tribes that once inhabited the land. This Arizona map site features road maps, topographical maps, and relief maps of Arizona. The detailed, scrollable road map displays Arizona counties, cities, and towns as well as Interstate, U.S., and Arizona State highways. The pannable, scalable Arizona street map can be zoomed in to show local streets and detailed imagery. to view a scalable Arizona road map. The detailed Arizona map and the regional Arizona map display cities, roads, rivers, and lakes as well as terrain features. The detailed map shows only the State of Arizona, while the regional map shows Arizona and the surrounding region. Arizona's capital city is Phoenix. Other major cities found on the Arizona map include Tucson, Mesa, Glendale, Scottsdale, and Tempe. Except for Tucson, most of the larger cities are located in the southern part of the State, near Phoenix. In 2005, the population of Arizona was estimated at 5,953,007, which is about 52.3 people per square mile. In 2010, Arizona's population rose to 6,392,017 people. The state's primary Interstate Highways include I-8, I-10, and I-17, as well as I-19 and I-40. The name Arizona is derived from the Pima Indian word "Ari-son," which means "place of the little spring." Northern Arizona's Colorado Plateau is cut by many steep canyons, including the Grand Canyon through which the Colorado River flows. The state's scenic attractions include the Petrified Forest, Hoover Dam, and Fort Apache, as well as the reconstructed London Bridge at Lake Havasu. For additional Arizona travel and tourism information, visit the official Arizona tourism site and Arizona Atlas. This online Arizona reference map shows major cities, roads, railroads, and physical features in Arizona. 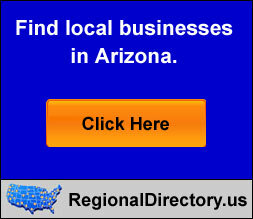 Several map publishing companies offer printed maps of Arizona. For example, Omni Resources offers several maps of Arizona that feature points of interest, airports, and parks, as well as selected local attractions and insets of major Arizona cities. Arizona-Map.org Editor, State Maps, PO Box 775, Barnegat, NJ 08005.